Although his own mother and father have forsaken him, Stanley has found a very supportive spiritual family within the Seventh-day Adventist church. Papua New Guinea (PNG) is a mountainous island nation. The main island lies just north of Australia. Papua New Guinea shares the island of New Guinea with Papua, a province of Indonesia. About 7.3 million people live in PNG. While the cities are modern, many people still live in small villages in the mountains. Although they may see a village on another mountain ridge, it could take days to hike there, and it’s likely that they don’t speak the same dialect. More than 700 different languages and dialects are spoken in PNG. Although he is only 15, Stanley is no stranger to violence and sorrow. His alcoholic father neglected to provide for his family and often came home drunk. One particular instance is seared into Stanley’s memory—when his father and uncle had an especially violent argument and his father was stabbed in the back of the head. Amazingly, his father was able to make it to the hospital for treatment. Although he survived, the father abandoned his wife and children and went to Port Moresby, where he married another woman. Only later did his first family learn what had happened. Stanley’s mother struggled trying to provide for her children, and after a while remarried. Sadly, the step-father was even more cruel than the father had been, and often chased Stanley and his sister out of the house or threw them off a high porch. It was about this time that Stanley’s grandfather died. As the family gathered together to mourn, one of Stanley’s aunts arrived from Port Moresby. When she learned the difficult circumstances that Stanley and his sister were in, she told them that she would pay for them to attend a boarding school where they could be away from their step-father. 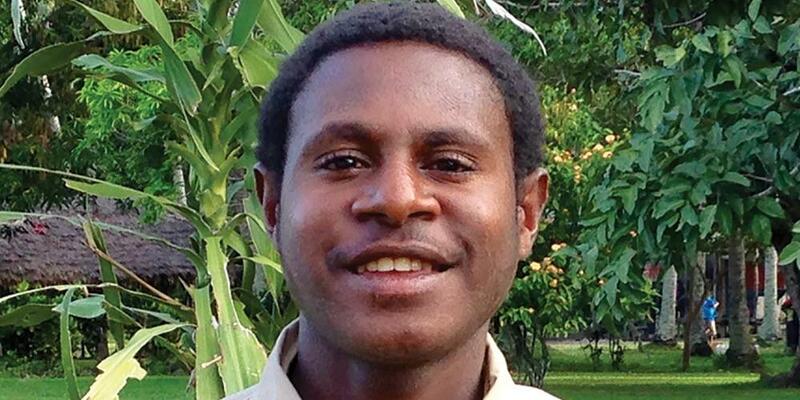 After a year, the aunt brought the two to her home in Port Moresby, but the place was too small for her own family as well as Stanley and his sister. Not wanting to send them back to where they would be mistreated, the aunt sent them to the Papua lowlands to live with her children’s former babysitter—a woman named Lorna, and her family. Lorna and her husband had a young daughter named Grace, who at the age of 3 was already a little missionary! Although her father was a former Adventist and no longer went to church, and her mother attended a Lutheran church on Sundays, they allowed Grace to go to a nearby Seventh-day Adventist church with her cousins. Grace, however, hasn’t given up. “I always pray for my daddy,” she says. And she continues to remind him that he needs to quit his bad health habits! Stanley joined the Pathfinder club and enjoys the many activities. One of the deacons in the church noticed Stanley’s dedication and his humble spirit and invited him to help out in a branch Sabbath School each week. The deacon became a spiritual mentor to Stanley, who has recently decided to fully give his heart to Jesus. “That is my promise, and I will follow that promise all the way,” he says. Your Thirteenth Sabbath Offering this quarter will make a big difference in the lives of the children in Papua New Guinea and other islands in the South Pacific where children have no place to gather for Sabbath School and other meetings except under the trees. The offering will help to provide several “lamb shelters” where the children can meet regardless of the weather. Thank you for giving generously!